I love doing my nails. It is a time where I get to relax, have some time to myself, and even catch up on beauty videos on YouTube. Life has gotten really busy and these "peaceful moments" are now few and far between. I really have to multi-task while my little one naps and let's face it, multi-tasking with wet nails doesn't work well! "Go get a gel manicure" you might say. My schedule and budget sadly don't allow for constant trips to a salon to get my nails done. Besides, I'm really "diy" when it comes to beauty! I need an at-home solution that dries quickly, lasts, and still helps me look, well, polished! That's why I have been loving the Jessica Cosmetics Phenom Polish System. It has the color selection, quality and ease of use I need to get a beautiful manicure that is just as good as going to the salon! The Phenom Polish System is comprised of 5-free polishes that, when topped with the Finale Shine, give up to 10 days of wear! "Can't I just use them on their own?" you might ask. In order to get this incredible lasting power, the flexible polymer in the Vivid Colour polishes must come in contact with the photo initiator in the Finale Shine topcoat. When combined, this system provides a chip-resistant manicure with incredible shine that actually gets shinier and harder with exposure to light, whether you are inside or outside! I tried these polishes two ways. On one hand I simply applied the Vivid Colour in two coats and on the other I did the same, only I topped it with the Finale Shine topcoat. The Vivid Colour polish applies smoothly with instant opaque coverage. With Pretty in Pearls (the lightest shade above) I honestly anticipated a thin, streaky application as I have experienced with practically every other light/barely there shade I own. Wow, was I pleasantly surprised! It had opaque coverage in just one coat - no streaks whatsoever. 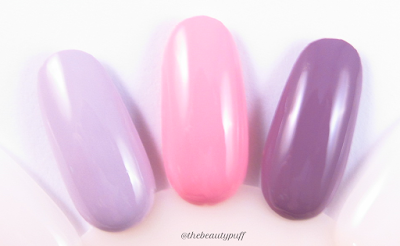 The formula is thicker than many typical polishes but still dried very quickly! There are no fancy lights needed for this polish to dry either, simply natural light. How easy is that? Without the topcoat, the polish lasted about as long as a typical polish would. I saw signs of slight chipping within a few days or so. It also did not have the gorgeous shine the topcoat provides. When used together, this system gave me a high-shine, long-lasting manicure for about a week! Keep in mind this is with constant dishwashing and household chores. I kept up with my daily activities as usual, there was no "babying" with this manicure by any means! When I changed colors, it was because I wanted to do my nails again, not because the polish looked horribly chipped. I only had slight chipping near my cuticles on a couple nails and at the tip of one finger. Removal of this polish was actually easier than some polishes I own that aren't advertised as long-wearing. I have some metallic polishes that come off in patches and I have to really work hard to remove them. These creamy polishes by Jessica Cosmetics were off my nails in less than a minute. (Just as reference I used a basic, pre-moistened Cutex nail polish remover pad.) There was no staining on my nails either. I found these polishes to be a breeze to work with! I am thoroughly impressed by these polishes. I have searched and searched for an "at-home" solution that does not destroy my nails or take forever to achieve a flawless, long-lasting manicure. In all honesty, I have gotten my nails done at a salon twice in my life. I prefer to do my nails on my own and I love having fabulous products I can use again and again to achieve salon-like results! Jessica Phenom polishes come in a great range of shades - everything from light neutrals to deep jewel tones to transition into the colder months. The formula, regardless of color, is literally "Phenom"enal! Throughout the time I had them on my nails, I kept analyzing them skeptically, thinking, "there must be a chip somewhere." But no chips were to be found - just shiny colorful nails that required no attention except to admire and enjoy!